There are only two players I have an avid interest in collecting. There are a few guys that when I see their card, I'll pick it up and put it in my binder (ARod, Cole Hamels), but I don't actively seek them. The first (No. 2 in your scorecard and No. 1 in my heart) Derek Jeter. The other is Kevin Kouzmanoff, known affectionately as KOOOOOOOOOOOZ! I started collecting his cards because of his heritage. Sadly, at the time I didn't know much about him because I got rid of the MLB Extra Innings package and my San Diego Padres info was at a minimum. I knew Jake Peavy. That was really it. He's Macedonian (although I've recently learned they call him the Russian Rocket or something goofy like that). My parents were born in Montenegro and are of Albanian heritage. Many Macedonians are also of Albanian heritage and I don't know if that's Kouzmanoff's case, but Macedonian is about as close to Albanian I'm gonna get these days. Lee Elia is Albanian and I actually met him in New York when he was the pitching coach for the Seattle Mariners, but I'm not really into collecting his stuff. But if you haven't heard his rant, listen here on a YouTube clip. It's not Safe For Work, but it's awesome. So, now I collect him. I am really just going for his pre-2008 cards. If I get cards from this year, I put them in my binder, but I haven't sought them out as much as I have his 2003-2007 cards. Last week, I received a card that felt great to put into my binder. There was a little empty space in the Topps Co-Signers area. Then, I opened a bubble mailer and there it was. One of about three Co-Signers I was missing from last year's set. That was the sound the card made as I pulled it out of the bubble mailer, Link-style. (Anyone who plays any Zelda games knows that I'm talking about). So, in honor of that card here are my Kooz Topps Co-Signers. 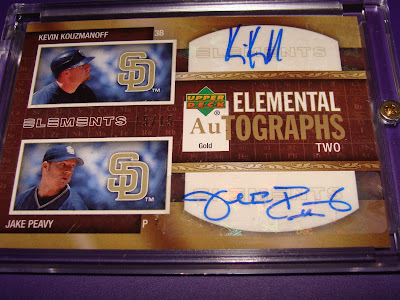 The only cards I am missing from the Co-Signers is the one numbered /50, /5 and /1. Here's a little extra. This is my favorite Kouzmanoff card that I have. 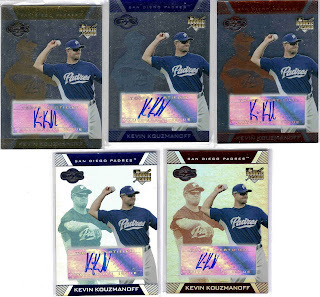 Wow that is a bundle of Koooouz Autos! Nice stuff - he has a distinct signature.